UNIONIST paramilitary Michael Stone was sentence on Monday to 16 years in prison for the attempted murder of Sinn Féin leaders Gerry Adams and Martin McGuinness during an attack on the North’s Assembly two years ago. A Belfast court also convicted the six times killer of six charges including possession of weapons and explosive devices. A notorious loyalist killer, Stone was responsible for the gun and bomb attack on the funerals of IRA Volunteers Mairéad Farrell, Dan McCann and Seán Savage in Milltown Cemtery in 1988 in which he killed three mourners. He was convicted of six murders, including the three at Milltown, the following year. Last month, when finding Stone guilty of trying to kill Adams and McGuinness in the Assembly, Judge Donnell Deeney dismissed the loyalist paramilitary’s defence that his attack on Stormont was nothing more than a piece of “performance art”. Stone had claimed the bombs, an axe, garrotte, imitation handgun and three knives he was carrying were artistic props. Judge Deeney described Stone as “a wholly unreliable and unconvincing witness whose testimony is wholly undeserving of belief”. On 24 November 2006, as the Assembly was meeting in Parliament Buildings in Stormont to elect an Executive after agreement between Sinn Féin and the DUP, Michael Stone, brandishing a handgun, forced his way through the main doors of the building. Aside from the other weapons Stone had, the explosive devices were described by an expert as “viable” and could have caused death or serious injury. Despite his defence that his foray into Stormont was a piece of performance it came to light days after his arrest that Stone had written to two newspapers in advance, outlining his plans. Stone told detectives during questioning that he had “unfinished business” with Adams and McGuinness which is why he went to Stormont. Eight years ago, Stone was freed early on licence under the Good Friday Agreement. 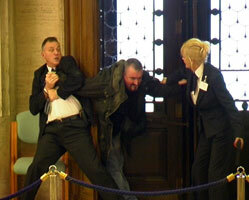 Now that he has been found guilty and sentenced for the Stormont attack, Stone’s licence will be revoked. This will result in him serving the remainder of his sentence for the killings of Caoimhghín Mac Brádaigh, Thomas McErlean and John Murray at Milltown Cemetery as well as the killings of Paddy Brady, Kevin McPolin and Dermott Hackett for which he was also convicted.